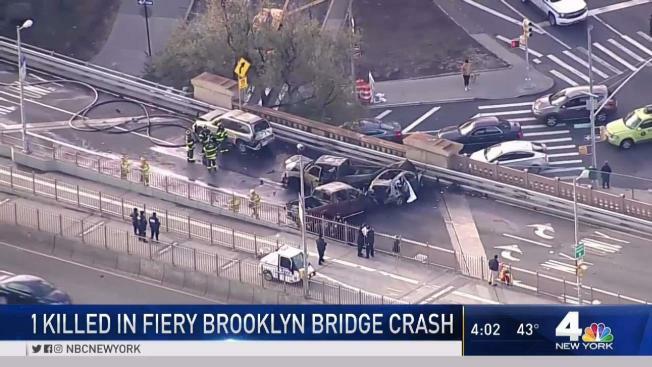 One person was killed and five others were injured in a fiery multi-vehicle crash on the Brooklyn Bridge Wednesday morning, police say. Rana Novini reports. One person is dead and five people have been injured in a three-car fire on the Brooklyn Bridge, police say. The bridge was initially closed due to the deadly fire, but has since reopened lanes. The blaze broke out about 7:14 a.m and was put out before 8 a.m. Four cars were involved in an accident and three cars erupted in flames, officials said. A commuter shot this video after three cars caught on fire on the Brooklyn Bridge. Video from the bridge during the fire showed a large plume of black smoke coming from the three cars. Commuter Steven Miller came across the accident, and video he shot shows two cars in a ball of flames on the bridge, black smoke pouring into the sky. In the video, another commuter is heard saying he thought he saw a person in one of the vehicles. "Flames were going up a good 10 to 15 feet in the air. Smoke was going up another 40 to 50 feet and climbing," Miller said. Another driver, David Hiltzik, who saw the ball of flame said the first question that came to mind was "Did everyone get out and how did it happen?" Investigators were on scene for most of the morning trying to piece together how and why the accident occurred. They towed the charred remains of the cars and tried to get traffic flowing — forcing drivers heading to Brooklyn to turn around and head back. Traffic was affected on and around the bridge for hours, with some drivers stuck on the bridge for more than two hours. The traffic repercussions were also felt by pedestrians who were turned away from the walking path on the bridge. Check below for latest commuter and transit updates.